Before attempting to use any power tools, CAUTION: always read and understand the directions of any tool that you use and always wear safety glasses. Safety has to be a priority! Once you are ready to begin cutting the boards, follow the material list above to begin cutting the required boards at appropriate length and width. 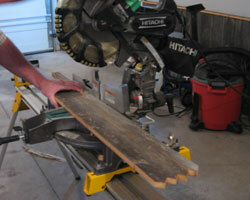 Once the boards are cut, lay the support boards out on a solid surface approximately 12 inches apart. Lay one of the 2 foot boards across the support boards with equal distance on both sides of the support boards. Use a square to align the boards. Place the other 4 boards across the backer boards equally spaced with the 3 foot board in the center. 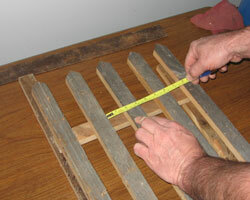 Use your square to check alignment and attach with nails. 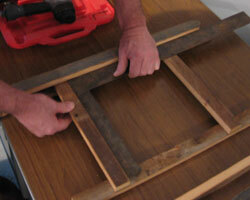 You may want to add Wood Glue for extra strength before nailing. 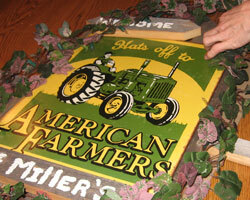 Put your 12.5 by 16 inch tin sign bought at StationBay.com on top of the wood space evenly from top to bottom and side by side. Attach with nails or screws. 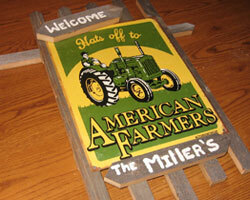 Place paper on a table, and paint on the 2 ½ by 10 inch board a Welcome in white paint. 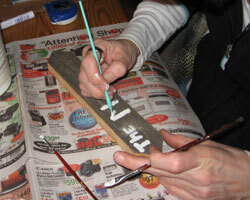 Then paint your last name or anything on the 2 inch by 11 inch board. 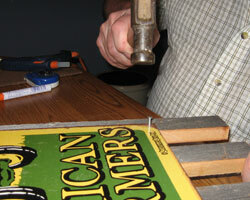 When dry, place the Welcome board at the top of the tin sign, at an angle, an attach with nails or screws until secure. 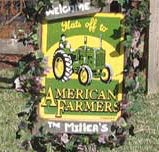 At the bottom of the tin sign, place and center the Name board ( 2 inch by 11 inch board) against the tin sign. Take the 35 bulb holiday light set and wrap it around the length of the green 6 ft. garland. Keep the bulbs tight against the garland. This will secure the lights around the fence when attached. 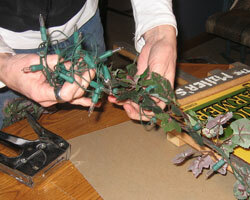 Begin to staple the garland and light combination to the wooden fence. On the back of the fence, start to staple the plug end of the light. Be very careful not to puncture the wires to the lights when stapling to the wooden fence. This will damage the lights. Lights are optional on this project. Caution. 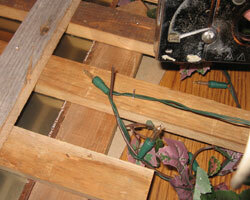 If you use lights, be sure the staples haven't punctured the insulation on the wiring on the light set. Continue attaching the garland and lights around the fence making sure you have reached the other side of the fence with the garland and lights.